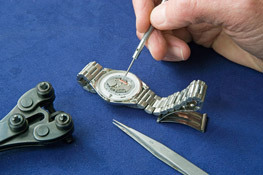 Denig Jewelers is a full service watch and jewelry repair store. Weâ€™re here to care for the pieces that are most precious to you. Whether itâ€™s restoring a family heirloom, or creating a one-of-a-kind piece, our skilled jewelry craftsmen deliver exceptional results. We will also clean and inspect your jewelry free of charge whenever you stop by.